When people play sports, they always end up happy and sweaty. Most sports enthusiast bring their sports essentials such as promotional sports bottles, deodorants, custom sports towels and colognes every time they’re out in the sun. As such, Milo sees this as a great opportunity to market and promote their products. The choco malt brand has made huge waves in the marketing industry and is known to make compelling marketing gifts. In fact, our team found a great towel giveaway in an Asian supermarket. First, let’s define a good quality towel. A perfect towel depends on the needs of the person; beach towel, microfiber sports towel, or a hand towel. The top characteristics that make a great towel are absorbency, softness, durability, and quick dry ability. Certainly, Milo’s towel giveaway has its own high and low points. But, this doesn’t mean that they’re giving away a low-quality item. When our team checked Milo’s towel giveaway, we found out that it’s made from cotton which makes it soft, light, and absorbent. Though it’s not as soft as those towels that are made from premium combed cotton, Milo’s towel is pretty decent for a marketing giveaway. What Makes This Marketing Giveaway Great? Branding Potential – As you may have noticed, Milo marks their promotional items with their own personal branding. 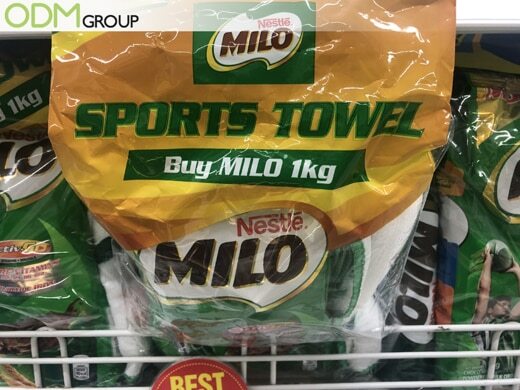 Therefore when someone uses their custom printed towels, people see Milo’s logo which helps in brand recognition. 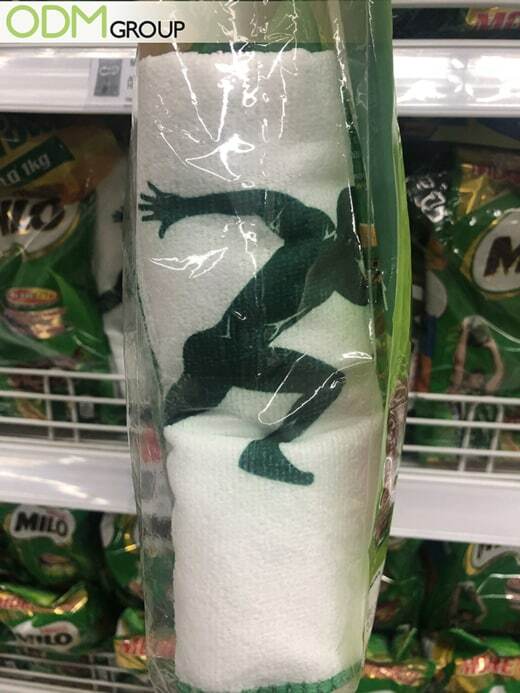 People will associate the towel with Milo. Check out this GWP mug fully customised with Milo’s logo. Practicality – A towel is an essential part of our daily lives. We use towels not just during sports but also when we do chores. In fact, we have our own towels at home. So, this means that Milo’s move to giveaway towels is pretty clever because they target the needs and not just the wants. Customer Retention – Who doesn’t want to receive practical items for free? Of course, customers appreciate the fact that their favourite brands are giving them something on top of their usual purchases. This is a sure win for both parties because when customers are happy, the brand benefits from it. Our team highly suggests that Milo should have had looked into their product packaging. They could create better packaging than the one that they are currently using. Also, they are using single-use plastic which is bad for the environment. In the future, they could use eco-friendly materials that would look great on their products. This is a good example of an eco-friendly packaging because this brand uses cardboard instead of the usual thin plastic. Overall, a great towel giveaway affects the brand positively which could help boost sales and profitability. So, if you’d like to create your own promotional towels, please don’t hesitate from contacting the ODM team anytime. This melamine bowl is a great complementary product to Milo cereal as customers will use it to consume the cereals. It encourages use and is made of melamine which is light-weight and relatively durable. With this, you can be sure that it will encourage sales of the product. There are four designs of Mr Milo. Every design is released fortnightly. This attracts potential customers to purchase Milo products frequently in order to collect all the 4 designs. There are also only 450 pieces of each design. This makes the promotional item highly exclusive, thus increasing the perceived value of the item. This is a great promotional product because it encourages customers to buy more Milo Nuggets in order to use the dispenser. The nugget dispenser is branded with Nestle and Milo Nuggets logo which promotes brand recall in every use. Lastly, Milo offers a Buddy bendable pencil and eraser set wherein kids may use in school. This is a good promotional campaign because it targets its main customers — kids.